Owning a trampoline is a choice you and your family makes. At Edgar Snyder & Associates, we want you and your loved ones to stay safe. Please be sure to follow these trampoline safety tips. 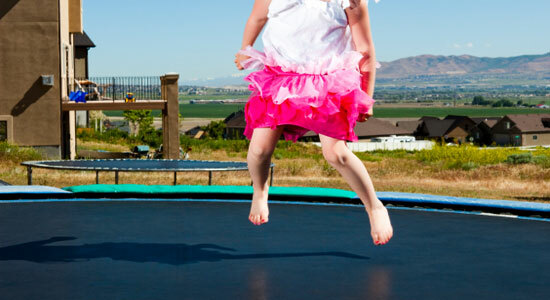 Children under 6 shouldn't use a trampoline, but encourage all kids and teens to be careful. Nearly two-thirds of trampoline injuries occur in children ages 6-14 (according to the Children's Hospital of Philadelphia). Kids should remain in the center while bouncing. Limit trampoline use to one person on at a time. Most injuries occur when more than one person is on the trampoline. Children should not attempt somersaults on the trampoline. Remove access ladders from the sides of the trampoline. Position the trampoline at ground level and on land that is flat, away from trees, concrete, fences, and bushes. Cover exposed steel frames and springs with a safety pad. Always use a safety net to enclose the trampoline. Check the trampoline regularly for defects or unsafe parts, such as rusty springs, sharp metal, shredded netting, etc. Unsafe products cause hundreds of injuries every year. Taking the proper precautions can help prevent trampoline injuries, but if you or your child were injured by an unsafe trampoline, it may not be your fault. The manufacturer, distributor, or supplier of the trampoline may be to blame, and you may have a case. There's only one way to find out. Call 1-866-943-3427, or fill out the form at the top right of this page for a no obligation, free legal consultation. Our phones answer 24/7, and you have nothing to lose. Learn your legal options today, before it's too late.